They glitter, they dazzle, they fool the eye, but one thing is certain: they are all concocted by the world's most beloved and successful designer of costume jewelry, Kenneth Jay Lane. 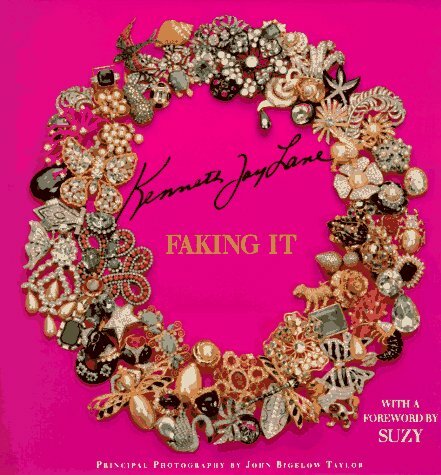 In Kenneth Jay Lane: Faking It, the designer tells us in his own words about his remarkable career and equally remarkable life. The entertainment begins as Lane recalls his transformation in the early 1960s from a shoe designer for Christian Dior to his rookie period designing jewelry for Hattie Carnegie. Knowing "everybody" was the best way to build a career, and this bon vivant has been fortunate to combine life and work into one seamless string of delightful adventures, all of them wonderfully told. We learn of Kenneth Jay Lane's friendships with Diana Vreeland and the Duchess of Windsor; with First Ladies Jacqueline Kennedy Onassis, Barbara Bush, and Nancy Reagan; and with such legendary film greats as Audrey Hepburn and Claudette Colbert - all of whom inspired and wore so many of his jeweled creations and are seen here in period photographs. Not only did women influence the designer, but so did his various travels and his great interest in art. From the markets of India to the Crown Jewels of England and the world's great jewelry houses, Faberge and Cartier among them, Kenneth Jay Lane has found scores of ideas for his celebrated creations. Paired with Lane's charmingly told anecdotes are dazzling photographs of his jewelry.